This article is a short summary of New Super Mario Bros. Wii. New Super Mario Bros. Wii is a 2D platforming game in the Super Mario series, released in 2009 for the Wii. It is notable for being the first 2D Mario title released for a home console since the release of Super Mario World, and is the first Super Mario Bros. title to feature cooperative multiplayer. 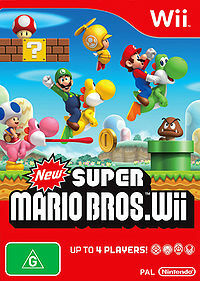 Selling over 29 million copies worldwide, New Super Mario Bros. Wii is the fourth best-selling Wii title. The game was later re-released in Europe as part of the Nintendo Selects lineup, while in North America it was simply re-released with a standard box at a lower retail price. The game was also included in select console bundles. Mario leaps into an all-new adventure! Scramble through courses with up to four players at the same time! Run, stomp, and fly through eight worlds packed with enemies and surprises! Power up with new items like the Propeller Mushroom, Penguin Suit and more! Take on tough courses together with your friends or compete for the best score! Run and jump to your way to fun with Mario™ & friends! Developers at Nintendo have dreamed of creating a simultaneous multiplayer Super Mario Bros.™ game for decades. The Wii console finally makes that dream come true for everyone. Now players can navigate the side-scrolling worlds alone as before or invite up to three others to join them at the same time on the same level at any point in the game for competitive and cooperative multiplayer fun. With the multiplayer mode, the newest installment of the most popular video game franchise is designed to bring yet another type of family entertainment into living rooms and engage groups of friends in fast-paced Super Mario Bros. fun. Mario™, Luigi™ and two Toads are all playable characters, while many others from the Mushroom Kingdom make appearances throughout the game. Players can even ride different Yoshi characters and use their tongues to swallow enemies, items and even balls of fire. In some areas, players use the motion abilities of the Wii Remote™ controller. The first player to reach a seesaw might make it tilt to help his or her character reach a higher platform – or might make it tilt incorrectly just to mess with other players. New items include the propeller suit, which will shoot players high into the sky with just a shake of the Wii Remote, and Mario’s new ability to transform into Penguin Mario. At the end of each stage during the coin battle multiplayer mode, players are ranked based on the number of coins they have collected. On the day of Princess Peach's birthday, Mario, Luigi, and two Toads are celebrating at the castle. A giant cake appears, which is revealed to be a disguise for the seven Koopalings as well as Bowser Jr. As the group takes Peach away, the Mario bros. and Toads step into action. Much of the basic gameplay of New Super Mario Bros. Wii has been carried over from the original New Super Mario Bros. For the first time in the series, up to four players can play simultaneously in competitive and cooperative multiplayer; while player one is Mario, the other players can control either Luigi or one of two Toads (blue and yellow). Each player has their own life counter, and if one player loses a life, they respawn in a bubble that can be popped by the other players to return them to the course. The bubble functionality can also be activated manually, but is only available in multiplayer. If all players have lost a life or the remaining players are in bubbles, then they fail the course and return to the map screen. New power-ups for this game include the Ice Flower, which allows players to freeze enemies and pick them up; the Propeller Mushroom, which allows players to fly into the air; and the Penguin Suit, which grants the same abilities as the Ice Flower but gives the player improved control over swimming. Yoshi also returns in this game, functioning much the same as he does in Super Mario World. New Super Mario Bros. Wii Wii (Nintendo Selects) EU June 13, 2014 A re-release of the original game under the Nintendo Selects line. JP: August 9, 2016 A direct port of the game released as a digital download on the Wii U Nintendo eShop. New Super Mario Bros. Wii Nvidia Shield TV CHN: December 5, 2017 A direct port of the game released as a digital download for the Nvidia Shield platform, exclusively in mainland China. ↑ Nintendo Wii, GameCube games come to China on NVIDIA Shield. Engadget (December 5, 2017). Retrieved December 5, 2017. This page was last edited on 3 November 2018, at 22:39.